How did the corps take 8000 acres of land, you might ask. Why, by controlling the Mississippi River and keeping it from utterly destroying the economies of Baton Rouge and New Orleans and just destroying Morgan City. First, some background. 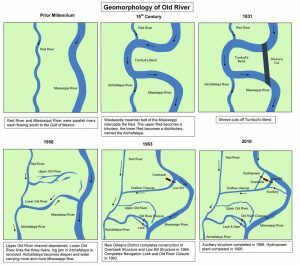 Many moons ago, the Mississippi River and the Red River were two completely separate waterways. Then, at some point, the Mississippi formed a bend (known as Turnbull’s Bend) into the Red River, splitting the Red River in two. The north section continued the name Red River while the south section was called the Atchafalaya River. Considering the inordinate amount of time it took steamboats to travel through Turnbull’s Bend, Captain Henry Shreve of Shreveport fame cut a channel, thus bypassing the bend and somewhat straightening the river. This left part of the old bend or river, which eventually became the Old River. 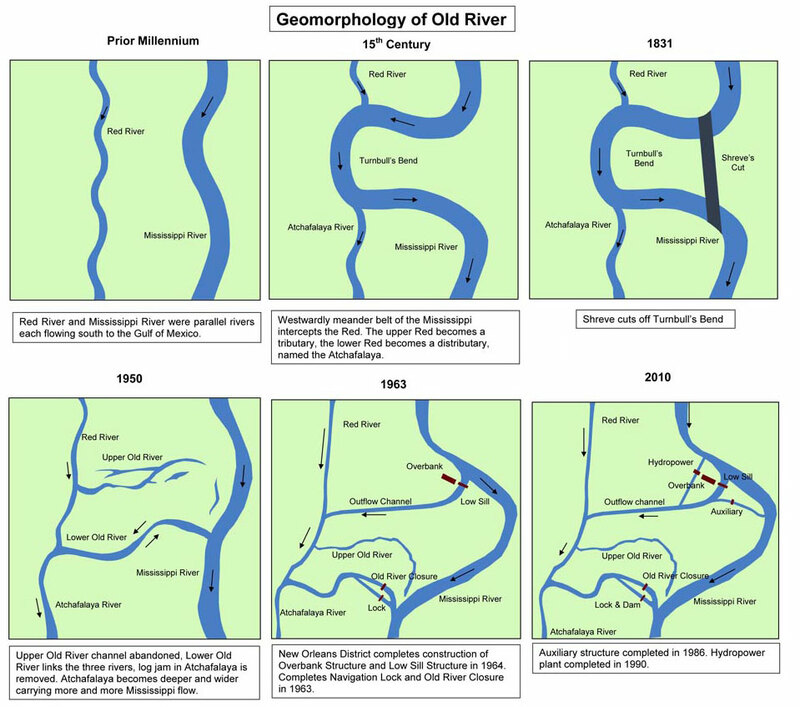 Eventually, the Mississippi kept flowing more and more into the Atchafalaya, and the Corps of Engineers took steps to prevent the Mississippi from changing course altogether. Not only would changing course severely Dan for the economies of Baton Rouge and New Orleans, the excess water flowing down The Atchafalaya would essentially flood Morgan City. The Corps built several structures known collectively as the Old River Control Structure to regulate the amount of water the Mississippi dumps into the Atchafalaya. 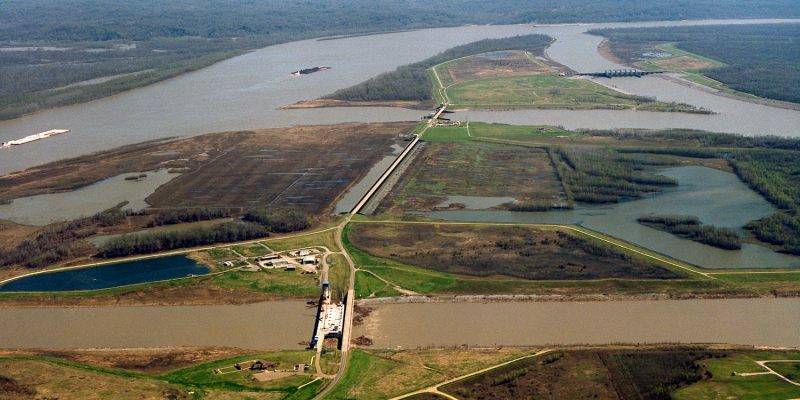 Not only did this have the benefit of keeping the Mississippi river main channel flowing through Baton Rouge and New Orleans, but it also could be used as a measure, along with structures such as the Morganza and Bonnet Carré spillways, to prevent flooding in those cities in times of high water. That’s a pretty startling statistic which, if true, certainly lends credibility to Hosemann’s arguments. But it does not prove them. Ooooops. Sue first, ask questions later. You can bet your bottom dollar that Uncle Sam has plenty of scientists and plenty of studies to show otherwise. Which, of course, begs the question: when will the Louisiana lawyers start the suits? I’m not necessarily passing judgment on the validity of the suits. I will leave that to the opinions of the water control experts. In my view, it would have been more prudent to have the studies in hand proving your accusations than to make half cocked claims in a federal lawsuit. But more pertinent for us here in The Great State of Louisiana, I would expect that if there is a way to reward his friends, you can expect our dear Governor to farm out such suits to contributors of his who may or may not be members of the Louisiana bar, especially in an election year and especially when his chief opponent represents the western side of the Mississippi river above the control structures. Either way, keep an eye on this one.